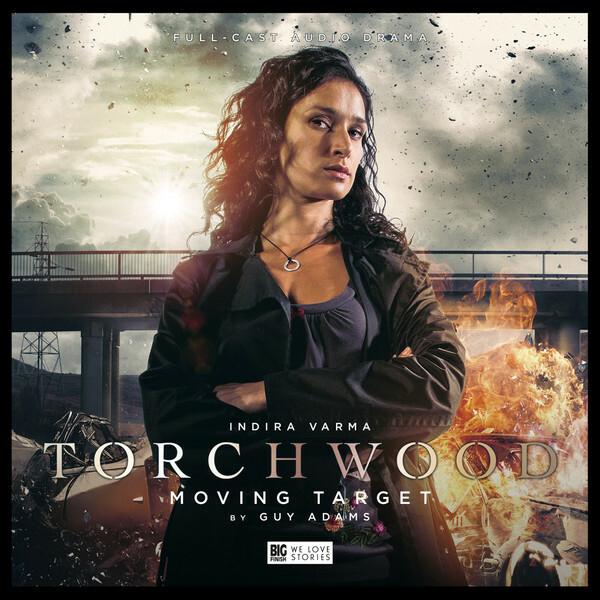 Big Finish: TORCHWOOD Moving Target Review | Warped Factor - Words in the Key of Geek. The joy of the Torchwood audios from Big Finish so far is that they’ve had their cake and eaten it. Yes, there’s some sort of overarching plot with a Big Bad called The Committee, but beyond that, the stories we’ve encountered have felt free to bounce us all the way around the Torchwood universe of time and space – back to the days of Yvonne Hartman of Torchwood One, back before Ianto died, so he could plummet to the ground in a rocket while on an insurance sales call, back even to the early days of Torchwood with Jack shepherding Queen Victoria around London and out of the path of a time-sucking alien slobber-beast. They’ve even gone forward, beyond the realms of TV Torchwood to investigate extraordinary creepiness at an old people’s home. What this gives us is both the thrill of trying to piece together a conspiracy theory plot in terms of The Committee and the excitement of freedom – if there’s a good enough story from any point in Torchwood history, it can be told. Which is presumably why Suzie Costello, first of the Torchwood Cardiff team to die on-screen, is back from the dead (again) in Torchwood: Moving Target by Guy Adams. Indira Varma, who played Costello in two TV stories, gets the chance here to do something that’s never been seen before – she shows us ‘Normal Suzie.’ Before she began plotting and breaking too many rules and becoming at least a notional baddie, this is Suzie Costello in the Torchwood world we’ve never really seen before, the pre-Gwen Cooper era when Suzie was one of the Hub’s main agents. Adams and Varma together create a Normal Suzie who’s likeably everywoman – we can’t help but agree with her immediate sentiments when her alarm clock goes off at the start of the day (though arguably, ‘lead character wakes up’ is one of the great clichés all new writers are told to avoid). And as Moving Target rolls along, we get a sense of her as a woman who’s friendly-by-Torchwood-agent-standards, but flawed down a faultline that will eventually lead to the Suzie we know from the screen. The plot is very simple, Adams generally preferring to keep his event-structures fairly uncluttered to allow the characters to fill in the majority of the action: alien fat-cats have paid to go on a hunt, like a bunch of American dentists who go to shoot lions. Earth has been designated a hunting ground, but all non-prey have been frozen in time so they remain unaware of the incursion. In fact, there’s only one prey-animal on this hunt, a young woman named Alex, whom Naomi McDonald invests with a curious combination of adorable verbal diarrhoea and annoying lack of consequence, like a young, doe-eyed, pre-Doctor Donna Noble. Fortunately, for complex reasons explained late in the day and largely to do with Suzie’s predilection for (*cough, cough*) borrowing unauthorised bits of Torchwood kit, Alex is not left alone on a planet full of dickless alien dentists who like to shoot small squealing things. Suzie steps in almost instinctively to the role of protector in what is, to all intents and purposes, the plot of Predator, only British, and funnier, and with a gloriously arch and snippy robot from the corporate hunt organisers to fill in the exposition-gaps. Is it the most intense episode of Torchwood you’ve ever experienced? No, it wouldn’t even get out of bed to enter such a competition. But what it does is deliver a fairly straightforward ‘hunting is bad’ lesson (also previously delivered in Star Trek DS9’s Captive Pursuit episode) to get our heroes running, while really being a lesson in Suzie’s character and priorities. There are developments later in the story that we’d love to tell you about, but aren’t going to, because they’d ruin the start for you – suffice it to say that the snippy robot, voiced with a highly effective Hitch-Hiker’s Guide tone by Nicholas Burns, not only makes us question our species’ sophistication and right to a place in the universe, it makes us question our own individual place in the universe, as well as the realities behind the softening fictions we tell ourselves to inflate our own worth and keep putting one foot in front of another. There are moments towards the end where Adams’ script becomes tough listening if you happen to be inflicted with anything so terrifying as a sunny disposition, and certainly, the choice that’s left to Suzie as to where her priorities lie – and the decision to which she comes – is startlingly bleak. But there’s a certain creeping bleakness even before that, as Suzie and Alex get drunk on vodka while killing alien hunters, and the honesty of these two flawed women trying to make themselves matter in the world is barbed and shocking when they turn it on each other. It’s enough to make you swallow down the humour of their interactions and look for a moment at the reality of most human lives – the bare, naked drives and needs that push us on to do the things we do, and the cold swash of anaesthetising optimism we need to make us ignore the nakedness of those drives in ourselves and others. When Suzie is faced with a seemingly impossible choice, the very nature of its impossibility makes her options clear, and she makes an unexpected move to fulfil her own needs. There’s an element in our optimism that makes us whine at that point that the ‘right thing’ to happen would be for the unending fleet of violent alien dentists to realise our importance as sentient beings and stop their cull, but you only need to look around the world with honest eyes to know that’s not what happens. In the same way that rich idiots continue to pay insane amounts of money for the pleasure of killing impressive (but as far as we know, not sentient) creatures – and in Adams’ script, the metaphor of consequence is extended to meat-eaters who don’t stop eating meat despite the inhumane treatment of animals en route to the roasting tray – so the threat of an army of fairly pathetic aliens who want to bag a human is not going away just because we want it to. Adams makes it clear that to pin your hopes on such an outcome is to be a chicken wishing really quite hard not to become a McNugget. And so Suzie Costello makes a move that not only meets her own psychological needs but has the added bonus of restarting time in the world. She makes a decision that seems impossible, and we learn that that’s essentially who Suzie Costello is – a saver of worlds and a maker of hard choices, inspired by her need to make a difference, to be special, to be good at what she does. Guy Adams is a writer who lures you in with normality and character comedy, and more often than not, delivers a stunning rabbit-punch to the face before he lets you go. Moving Target is another impressive entry in his growing Torchwood resume. Where to place it in the inevitable fan-ranking of stories is a tricky call, but probably right alongside another of his face-punchers, More Than This, would be its natural home. The return of Suzie Costello to the Torchwood universe is a very welcome development, and Varma gives her a capability and a charm that makes return engagements a thrilling prospect. Moving Target finally teaches us enough about Suzie Costello to make her inclusion in the Torchwood team make sense, as well as bedding in the flaws that eventually lead to her death. Give Moving Target a spin today – you’ll think you’re in for a fun hour, and you are, but be aware, the fun comes with a price.